It’s easy to get carried away with spending during the holidays. From buying gifts and decorating your home to preparing big meals and hosting parties, you can quickly burn through a paycheck — or two or three. The results show that many Americans have a pretty big holiday budget. Keep reading to find out how much Americans expect to spend on gifts, food, travel and more for Thanksgiving and Christmas. 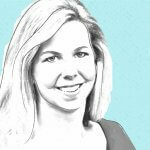 Nearly 57 percent of the survey respondents who are spending money on the holidays (i.e. those who did not choose “None of the above”) said they plan to spend one full paycheck. The average annual wage in the U.S. is $49,630, according to the Bureau of Labor Statistics. So weekly earnings are $954 on average, and the average pay for those who get paid every two weeks is $1,908. 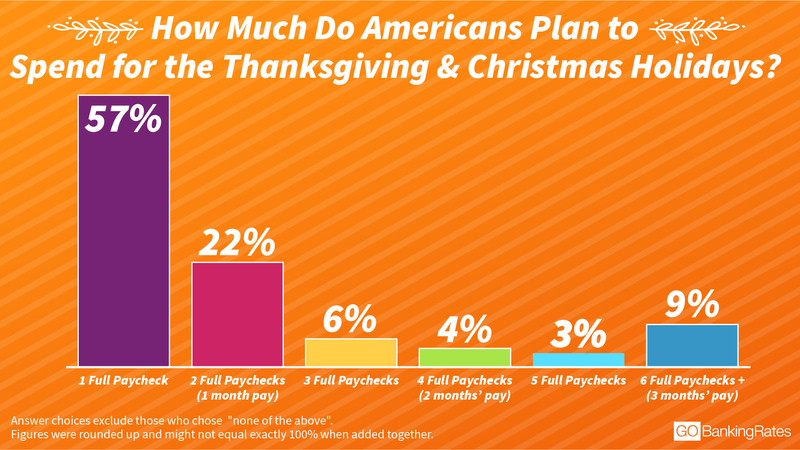 What’s more troubling is that 44 percent of respondents expect to spend more than one paycheck on Thanksgiving and Christmas. Among them, 9 percent plan to devote six full paychecks — or three months’ pay — toward the holidays. “Just think, this could be an entire family’s emergency reserve gone in a matter of minutes on purchasing unnecessary items,” said Brandon Hayes, a certified financial planner with oXYGen Financial in Atlanta. It’s not surprising, though, that people are planning to spend so much, he said. 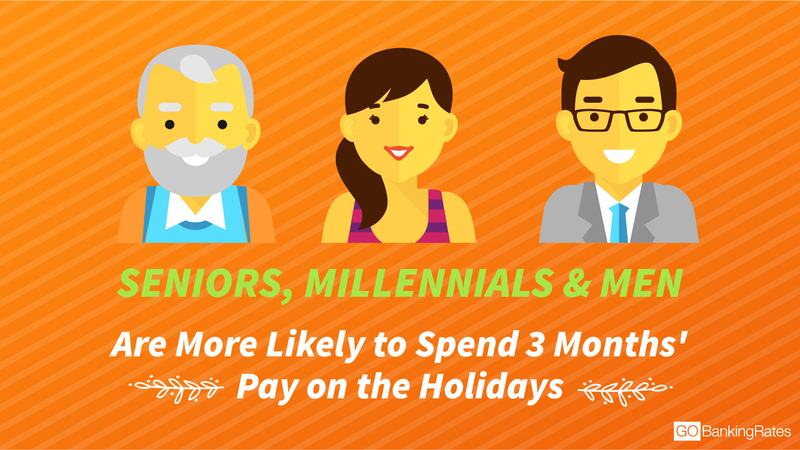 For both men and women, the most common amount they plan to spend on the holidays is one paycheck. However, a higher percentage of women than men plan to use more than one paycheck to cover holiday spending — 46 percent versus 39 percent. “I think this is mostly an indicator that women are doing the bulk of the shopping,” Bodge said. However, men might have a bigger Christmas budget than women. The survey found that nearly 12 percent of male respondents said they expect to spend six paychecks on Thanksgiving and Christmas versus just 6 percent of female respondents who said they plan to spend this much. The survey found that older Gen Xers ages 45 to 54 had the highest percentage of respondents who expect to spend two paychecks or more for the holidays at 49 percent. Adults 65 and older had the second highest percentage — 44 percent. Millennials, ages 25 to 35 had the smallest percentage of respondents — 40 percent — who said they plan to spend more than one paycheck. However, among those respondents, nearly 12 percent said they expect to spend six full paychecks on the holidays. An almost equal percentage — 11 percent — of adults 65 and older are willing to spend as much. “Older generations want to spend to provide the very best for their grandchildren,” Hayes said. Younger adults, on the other hand, are more likely to want to keep up with their friends, which Hayes said might explain why some in that age group expect to spend more. Across all age groups, though, Hayes said holiday spending often is triggered by emotions. “Once emotion takes over, it doesn’t matter how old you are — you have already lost the battle,” he said. If you’re wondering how much to spend on Christmas gifts, keep in mind that your holiday budget should be based on what you can afford — not what the average American is spending. If you’ve overspent during the past, you might need to adjust the way you celebrate the holidays this year. Create a budget for Thanksgiving and Christmas that won’t force you to rely heavily on debt or put your finances at risk. And, be willing to make some changes to your approach to gift giving. Better yet, ask yourself whether buying more “stuff” is the best use of your money or the best way to celebrate the holidays, Hayes said. Instead, “focus on things that are free like spending time with your family, reading a book at your local library, or creating life-changing experiences without having to break the bank for your loved ones,” Hayes said.